Anthem, a remarkable family community, offers life in abundance for people of all ages and interests. It is not just a place to live, but a place to live, play, work and do business. Anthem is located at the base of Daisy Mountain, approximately five miles north of Carefree Highway off Interstate 17, Anthem AZ is a master-planned community that provides all the amenities, services and conveniences of a big city, yet offers the serenity and charm of a small town. Anthem's beautiful and authentic desert landscaping is utilized and maintained throughout Anthem and it may be surprising to see how much bright and strong colors are found on the native plant life in the spring and summer months. Weather is absolutely delightful most of the year in Anthem. Anthem Agents, Anthem Lenders, Anthem Title, Anthem Escrow, and Anthem Inspectors are all important members in the Anthem Arizona real estate purchasing process. They must be the highest level of service and they must work together as one. Your Anthem MyOwnArizona realtor is the best coach in assembling the MyOwnArizona Team. The top Arizona realtors serving the Anthem area in the industry. Let our MyOwnArizona business professionals be of assistance to you and your needs. 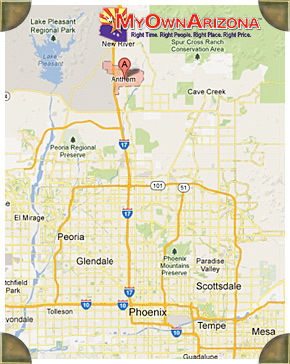 Contact us at:info@MyOwnArizona.com for Anthem Arizona real estate. Anthem AZ culture, sports, shopping & entertainment, outdoor adventure, golf -- the State of Arizona has it all. Whatever your lifestyle, our MyOwnArizona agents will find an Arizona community to match. And maybe introduce you to some Anthem Arizona neighborhoods you've never considered or even knew existed! Whether you are interested in buying Anthem Arizona real estate or selling Arizona property in the State of Arizona, work with someone like MyOwnArizona: professionals who want to earn your business. We are here to work along of you.